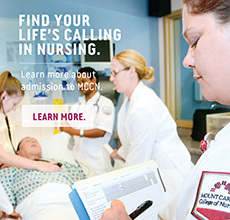 To participate in the Title IV Student Aid Program (Federal Stafford Student Loans, Federal PLUS Loans, Federal PELL Grants, and Federal Supplemental Educational Opportunity Grants), Mount Carmel College of Nursing must take steps to fulfill federal requirements to implement and make public the standards for satisfactory academic progress that students must meet to be eligible to receive Title IV financial assistance. These standards are for financial aid purposes only and do not replace or override the academic policies of Mount Carmel College of Nursing. A student must complete 67% of all hours attempted for financial aid eligibility. This is determined by dividing the total hours earned by the total hours attempted. Attempted hours will include grades of F, W, I. Yet, these grades will NOT count as earned hours. Repeating courses will add to the total number of attempted hours but will only count once as earned hours. If a student chooses to retake a course he/she has already passed at some point in the past, he/she can do this one time and receive financial aid for the course. Three or more attempts to take a course that has previously been passed cannot be funded with financial aid. A student can only receive financial aid for a maximum of 1.5 times the total credit hours required for his/her degree program. For any major that requires 124 credit hours for graduation this equals a maximum of 186 hours that can be attempted. For any majors requiring more than 124 hours, the maximum allowed will be calculated accordingly. Any hours attempted, but not completed will count. Transfer credit hours must be included in the maximum of 186. Repeated courses, failed courses and withdrawals will also count towards the maximum. An appeal must be submitted by any student who has exceeded their maximum timeframe allowed due to transfer hours or change of major. Student Financial Services will review the credits attempted that apply towards the student’s program of study in order to determine future financial aid eligibility. An academic plan signed by a Financial Services representative will be required. All Graduate programs require a 3.0 minimum GPA throughout the course of study. An undergraduate student must achieve a minimum cumulative grade point average of a 2.0. Repeated courses and failed courses will also count towards the cumulative GPA. Satisfactory Academic Progress – applies to any student who passed the appropriate number of earned hours to attempted hours, has not exceeded the maximum total attempted hours allowed for their program and his/her GPA meets the requirements listed above. Financial Aid Warning – applies to any student who fails to meet the requirements for completion, timeframe and GPA listed above for the semester/payment period. A warning letter will be sent at the end of the semester/payment period to the student to indicate why he/she is receiving a warning and what must be done within the next semester/payment period to be back in accordance with the SAP rules. If the student fails to meet these requirements, his/her federal, state and institutional financial aid will be suspended for future semesters/payment periods. The student must bring his/her hours and/or GPA back into good standing or appeal to regain financial aid eligibility. A student cannot have two consecutive semesters/payment periods on warning. Unsatisfactory Academic Progress – applies to a student who has not met the requirements for completion rate, GPA and attempted hours after his/her warning period. This student is not eligible for federal, state or institutional financial aid until he/she meets the requirements in each of the three areas listed above or completes and is approved for a SAP Appeal. Financial Aid Probation – applies only to a student who has failed to meet SAP requirements and has had an appeal approved by Student Financial Services. A student may be on probation for one semester/payment period only. If a student has not met the SAP requirements above, he/she should work with a Financial Services Representative to understand what options exist to regain eligibility. Academic Plan - This status applies to any student who has submitted an academic plan as part of a SAP appeal and has successfully completed the goals for that semester/payment period as outlined by the plan. The student continues to remain eligible for federal and state financial aid, but does not meet the definition of a SAP eligible student. A student who wishes to appeal his/her unsatisfactory academic progress determination must submit a SAP Appeal Form to the Student Financial Services office. SAP appeals are reviewed based on the extenuating circumstances such as serious injury or illness involving the student, death of an immediate family member or other circumstances beyond the student’s control that prevented them from achieving satisfactory progress. Each student’s circumstance is reviewed on an individual basis. Students appealing may also be required to submit an academic plan that indicates exactly what the student must take to finish their academic program and details in what time frame this can be accomplished. A Financial Services Representative will review the appeal and determine whether the financial aid termination is justified. The student will be advised by MCCN e-mail of the decision and may be asked to meet with a Financial Services Representative to plan for future semesters/payment periods. A student wishing to appeal the SAP decision may do so in writing to the Director of Financial Aid. Students are encouraged to review these standards and to be knowledgeable relative to his/her individual progress and financial assistance. The College recognizes that circumstances and conditions regarding these standards may require the discretional judgment of the aid office. Examples of such conditions include changing majors or career objectives as well as various personal reasons. Any questions regarding SAP or these conditions should contact Financial Services.